No generation yet, they’re not plugged in but we will by tomorrow! Then the garage roof suddenly failed and water was pouring in over my mains board. Not a very good position, so it was decided to replace it post haste. 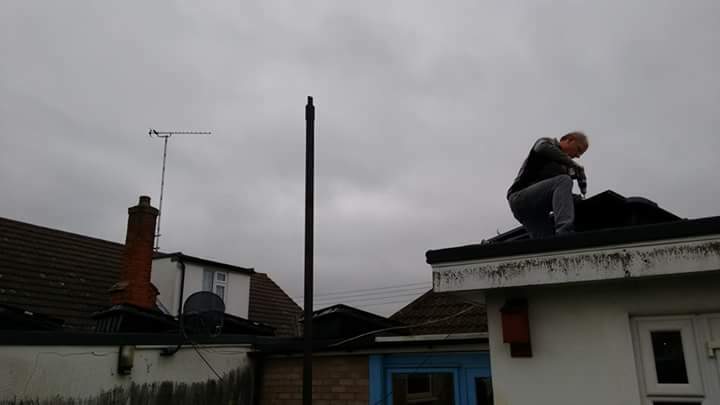 We replaced with 2×8 (so a party can now happen on the roof) or a solar farm. 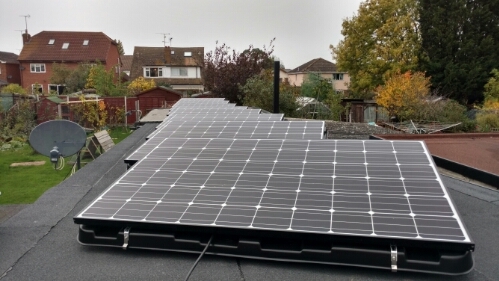 The system is just under 4kw (14 panels), installed by Clive of Complete Renewables (http://www.completerenewables.co.uk/) who’s a local Essex installer. We specifically went with him because he likes to use LG panels. I was also very interested in the microinverter solution he used from Enphase. 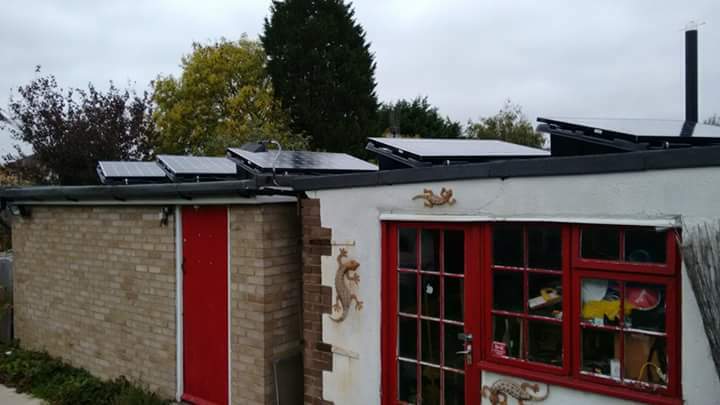 These allow any of the panels to be shaded without impacting on the others production (unlike normal inverters which are slightly less efficient in shading). Another interesting feature is the Enphase Envoy which picks up powerline signals from each of the micro inverters and allows you to monitor each panels production – though sadly this is current under fees. I’m thinking of getting an Envoy in a few months when it’s rumoured they’ll be releasing a new one which handles an “affordable battery solution” – I’m interested to see how this compares to the offerings by Tesla, though I think I may find that the Enphase microinverters make the Tesla solution incompatible. Anyway Enphase, if you’re listening I’d love to tie my generation stats into my blog for people see what I’m generating, so feel free to hit me up with an offer on an Envoy I can’t refuse. 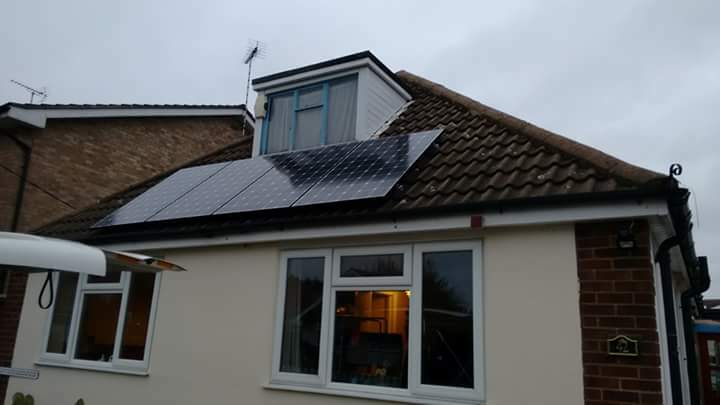 Why I’m having it done right now before the winter is because the solar FIT payments from the government finish in January, so if you’re not quick, your payback will be affected. Payback for this system is about 8.6 yrs. I'm Tim, a 31yr old ex-Allotmenteer. My wife and I used to have a small 5 rod plot in South Essex where we grew all manner of veg. I'm also involved in brewing the odd keg of beer. When getting down the allotment got too hard and our circumstances changed we bought a house with a 65ftx30ft garden, which we're converting into a mini orchard and veg beds. 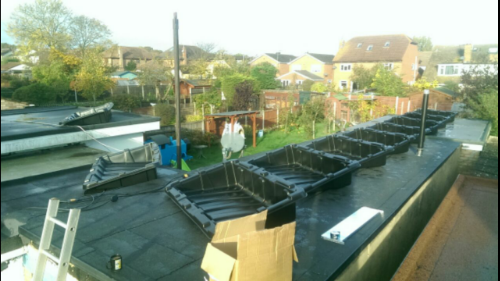 We get up to some weird and wonderful projects - we've built a small boat, a pig roaster (powered by a windscreen wiper), a chicken run, raised beds and try our hands at all sorts of stuff getting us closer to being 'self sufficientish'. The hope is to introduce chickens soon and hopefully let them free range during the day.